Everybody's heard of comets. They appear from time to time in the night sky of Earth and have a sort of "tail". What's the most famous one? Halley's, of course! The appearance of this object has been recorded as far back as the third century BC. It is named after Edmond Halley because he was the first person to calculate how long it was between appearances - approximately 76 years. Naturally, when considering these heavenly bodies in more detail, it's not quite as simple as that. Let's explore the reality. First off, Halley's is the only comet visible to the naked eye that has a comparatively short orbital period. This means that, if you live long enough, you'll have the chance to see it twice. All others that are observable without a telescope are long-period, only visiting Earth every few hundred, thousand, or even million years. There are almost 5,000 known comets and more are being discovered all the time. In fact, it's estimated that the outer solar system could contain as many as a trillion of these things. So, what are they and where do they come from? Very generally, they are small bodies consisting of a mixture of rock and ice and originate from either the Kuiper Belt and Scattered Disc (short-period), or the Oort Cloud (long-period). 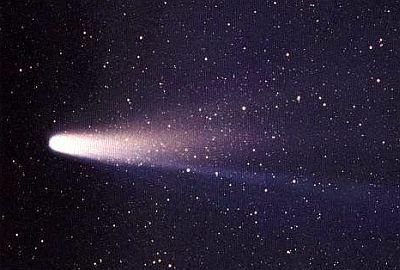 The icy content is very important, as it is responsible for the formation of the characteristic tail (also known as a "coma") that a comet displays as the heat from the sun vapourizes it. Apart from this tail, these heavenly bodies are pretty much the same as asteroids. The reason they appear in Earth's skies only occasionally is because of the vastly elongated ellipse that their orbits make. After rounding the Sun, they head off back into the far reaches of the solar system. These are designated as having an orbital period of 200 years or less. There are currently some 291 numbered ones and a whole host more that are un-numbered. On scrolling down the list, which can be found on Wikipedia, there were some whose names I recognised: Swift-Tuttle and Shoemaker-Levy, along with, of course, Halley. (No sign of Hale-Bopp, though.) If we consider Halley in more detail, it'll hopefully provide information applicable to these other comets. This is the official IAU designation for this body (the "P" denoting short period). As stated earlier, it visits Earth approximately every 76 years. The actual, more accurate figure is 75.32. As already stated, the orbit of this body is an elongated ellipse. The closest it gets to the Sun is 54,472,103 miles (between the orbits of Mercury and Venus), whereas, at its furthest point out into the solar system, it is 3,262,748,820 miles away, which is about as far out as Pluto. As for how close it comes to Earth, on the 19th of May, 1910, our planet actually passed through its tail! It caused a bit of a panic at the time, but, thankfully, Earth and its inhabitants were left unaffected. Despite its huge tail, Halley itself is pretty small, approximately 10 miles long and five miles thick. It appears to be mostly dark material and only some 10% of its surface is responsible for the origin of the tail. 2P/Encke was the second to be discovered, after Halley. Its distinction is that it has the shortest orbital period, at 3.3 years. A mere three miles in diameter, its orbit takes it from within the orbit of Jupiter to just within the orbit of Mercury. Due to celestial mechanics, it only has a near encounter with Earth every 33 years, when it could come as close as 16,090,650 miles. 109P/Swift-Tuttle was in the news in 1992 when it made one of its periodic visits to the inner solar system. With an orbital period of 133.28 years, it has the longest of any of the numbered short-period comets. It originates from the Kuiper belt and is distinctive in that it passes extremely close to Earth, astronomically speaking. In fact, it has been called "the single most dangerous object known to humanity". With a diameter of 16.7 miles, it is considerably larger than the hypothesized 6.2 mile diameter asteroid or comet that caused the mass extinction of the dinosaurs. Extrapolating Swift-Tuttle's orbit forward, it is thought that, on its future visit in 4479, it will have a one in a million chance of striking either Earth or the Moon, totally wiping out any life on our planet. Swift-Tuttle is also responsible for the famous Perseids meteor shower that occurs regularly over August 12th and 13th each year. 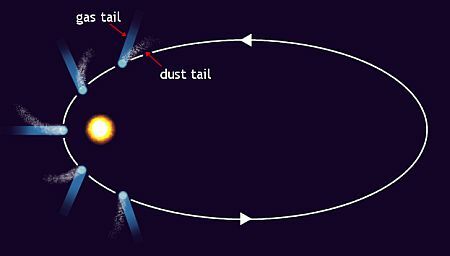 The shower consists of dust fragments from its tail entering Earth's atmosphere and burning up. Quite simply, these are objects that have been sighted only once and are unlikely to be seen again in the lifetime of the observer. Their orbits can last many thousands of years - even millions. Typically, they originate from a place in the solar system much further out - the Oort Cloud. 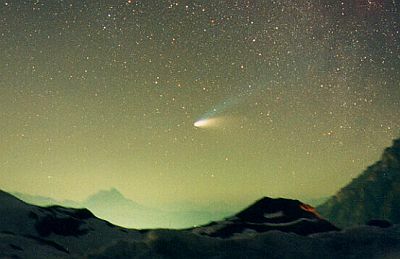 Possibly the most famous example in recent years, this comet appeared spectacularly in the night skies of Earth in 1997. At its closest, it was about 25,000,000 miles from the Sun. Its orbital period is over 2,500 years and takes it as far out as 34,468,013,175 miles. There have been tentative theories put forward that Hale-Bopp is actually a binary system, with the main body being 43 miles across. Its smaller partner, with a diameter of around 18 miles, orbits the main body at a distance of 112 miles every three days. This, however, is complete conjecture and hasn't been proved conclusively. Hale-Bopp was first observed in 1995 when it was still out between the orbits of Jupiter and Saturn. It is very unusual for a comet to be visible at such a distance. Even more unusual was that it already had a discernible tail. Almost all comets only develop a tail when they get close to the Sun. During the two years Hale-Bopp took to approach the Sun, murmurings began to emerge about a mysterious "object" shadowing it. This object was estimated by some to be up to four times the size of Earth! As it didn't appear to have enough mass to affect Hale-Bopp's trajectory en route for the Sun, it was suggested that it might be hollow. Then, naturally, it began to be touted as some sort of alien craft. Photos were posted on the Internet, showing this bright companion to Hale-Bopp. Of course, the conspiracy theorists came out in force - NASA was concealing the evidence of alien craft, just as the military had done at Roswell in 1947. Eventually, prestigious scientific organisations came out and explained everything away as naturally occurring. As regards which is the true explanation, you must decide for yourself - but these proponents of the alien craft theory suggested that it was connected to an imminent apocalypse on Earth which would happen in 1999. Well, we're still here, aren't we? What is distinct about this particular comet is that it has the longest orbital period of any yet discovered. It was first noticed by Edward Bowell in 1980 (hence its name) and reached the closest to the Sun in 1982. On its way, it passed very close to Jupiter, receiving a considerable boost to its velocity by the giant planet's gravitation. It is subsequently making its way away from the Sun at the highest velocity ever observed in a natural object. This trajectory will eventually take it out of the solar system and it is thought that the outer limit of its orbit could be as much as 1.17 light years. Its orbital period has been estimated at around 7.1 million years. This comet is more informally known as Shoemaker-Levy 9, because it was the ninth one to be discovered by Carolyn and Eugene Shoemaker, together with David Levy. It is being given its own section here because it caused a sensation in 1994 by crashing into the planet Jupiter. This incident had been predicted and was able to be extensively observed - the first time humans had been able to witness such a celestial event. 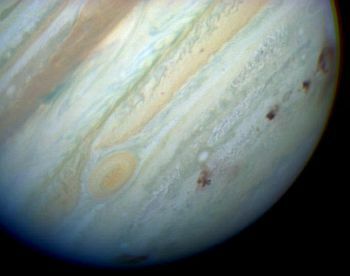 What was initially surprising was that Shoemaker-Levy 9 was found to be orbiting Jupiter, rather than the Sun - the first comet ever to be observed orbiting a planet. It is thought that it was originally in a solar orbit, but was captured by Jupiter's gravity, probably in the early 1970s. After its capture, it settled into an orbit lasting only two years, making it a short-period comet. Apparently, it passed extremely close to Jupiter in 1992, when the planet's strong gravity caused it to break up. On its next approach to the planet, its trajectory took it on collision course and 21 impacts were observed. One fragment, "G", caused the formation of a 7,500-diameter dark spot. It has been estimated that the impact released an amount of energy equivalent to 600 times Earth's total nuclear arsenal.